Hi there! I hope everyone is having a lovely Thursday afternoon. It's a beautiful sunny day here in Ottawa and the temperature is warm, but not too hot. It's almost the weekend so I'm in a very good mood since that means two days of relaxing. My aunt will be visiting us here in Ottawa so we also have that to look forward to on Saturday as well. My mum sent me a bunch of old photos the other day, which inspired me to start doing 'Throwback Thursday' posts. I won't be discussing any particular topic, but it will be a nice opportunity to reminisce and in some cases, laugh at old styles or funny pictures! The three kids enjoying life on deck! This week I chose a handful of pictures from a cruise we took about 13 years ago. We were either on the Celebrity Century or the Horizon I believe. My mum knows the exact details of the trip so I'm sure she'll correct me in the comments below. 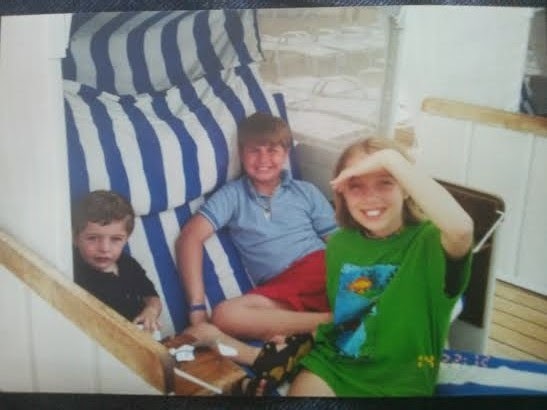 My brothers and I always had a lot of fun in the 'kids program', which involved lots of on-board activities and entertainment. We were all really excited when we got the chance to go backstage and try on all of the crazy costumes and accessories the performers wear for the extravagant shows they put on almost every night. 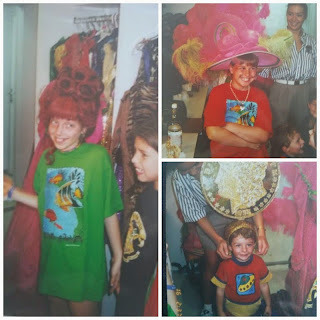 I still find it hilariously entertaining looking back at these photos and seeing my brothers (now much older!) dressed up with giant coins and feather hats on their heads! I'll be writing a travel piece entirely about cruise vacations soon, so stay tuned for that! That was on the Horizon, run by Celebrity Cruise Lines in those days! Those photos are from 2000 believe it or not! The Horizon had one of the best children's programs we've encountered. The youth staff were great and there were a lot of kids! You were always doing something fun - going back stage, attending an actual floor show, jammies parties with grilled cheese sandwiches and chocolate chip cookies, pillows and movies. Fantastic memories!